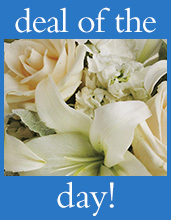 Let her know how much she means to you with beautiful flower gifts for your wife or girlfriend. You don’t need a special reason. All you need is love and the services of your local Teleflora florist, who has all kinds of gorgeous flowers, ready to be artistically arranged and hand-delivered to her door. When it comes to sending flowers gifts for your wife or girlfriend, only Cupid does it better. Same-day delivery available.